Callum Smith vs Erik Skoglund Sept 16th in Liverpool - Tickets on sale! The battle for the inaugural 168lb Muhammad Ali Trophy begins on September 16th with the first of the World Boxing Super Series’ hugely anticipated super middleweight match ups. British betting favourite and number two seed Callum Smith (22-0, 17 KOs) will meet undefeated Swedish star Erik Skoglund (26-0, 12 KOs) in a quarter-final bout at the Echo Arena in Liverpool, United Kingdom. Smith, who is undefeated in his twenty-two professional contests, selected Skoglund as his quarter-final opponent during the live Draft Gala on July 8th at the Grimaldi Forum in Monaco, and as one of the four seeded super middleweights he will enjoy home advantage for his first tournament test. ‘’A ring is a ring no matter where it is, but of course, I’m happy to be fighting in Liverpool,’’ said Smith. ‘’This is my home and this is where all my best performances as a professional have been. I like fighting in Liverpool, and with the crowd behind me, I will have an added advantage on September 16th. ‘’There are no easy fights in this tournament. It’s the best fighting the best, but I believe I made the right decision in Monte Carlo. That’s not to say Skoglund is not a good fighter. I think he is a very good fighter. His record speaks for itself, but I think stylistically, he was the right choice for me. 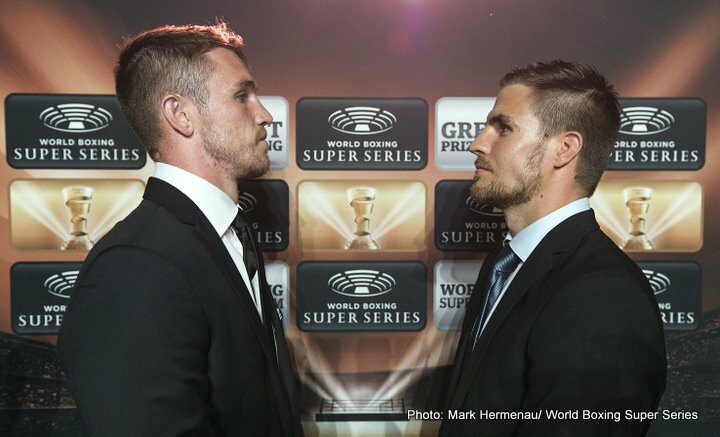 Skoglund, who is unbeaten in his twenty-four paid fights and ranked with all major governing bodies at 175lbs before moving down in weight, is relishing the opportunity to go toe-to-toe with one of the division’s top talents, and believes the winner of this fight can go on to lift the coveted Muhammad Ali Trophy. ‘’This is a huge opportunity for me to prove myself at the highest level,’’ said Skoglund. ‘’Callum Smith is a top-level fighter and one of the tournament favourites. This is what the World Boxing Super Series is all about – the best fighting the best! That’s why I entered and that’s why I’m really looking forward to this fight. Ticket details for the quarter-final clash between Smith and Skoglund on September 16th at the Echo Arena in Liverpool will be announced next week.